When Damien enters Aurora’s life, tempting her with promises of dark passion and forbidden lust, he threatens to tear her peaceful world apart. Damien faltered. She had seen his dark side. She saw him kill the assassin with no remorse, no mercy. He should leave. He should turn around and get the hell out of here. Roke be damned. She launched herself past his open palm and into his arms. “Damien,” she whispered. For a moment, Damien stood shocked, shocked she would touch him after seeing how he had killed the assassin. And then, it didn’t matter. All that mattered was that she was alive. Damien wrapped his arms around her, holding her tight. A movement shifted through the forest. Damien froze suddenly and jerked his head sharply to his left. He firmly set her away from him. He grabbed the sword from the ground and stepped in front of Aurora, scanning the surrounding trees. The dead assassin’s blood slowly dripped down the blade. The brush around them bent slightly in a soft breeze, drawing his attention this way and that. No birds sang. No sound other than the defiant rustle of leaves reached his ears. He stood very still, waiting for whoever was out there to move first. He was convinced someone else was there. Damien heard the rustle of Aurora’s skirts as she moved up to him. She touched his arm with trembling fingers. Anger tightened Damien’s fist. How many damned assassins were after her? After this one little, innocent woman? How many assassins did it take to kill her? How many assassins was Roke willing to risk in this game? “Are you hurt?” he whispered to her. He kept his gaze moving, scanning the area around them as he talked, his sword grasped tightly. When Aurora didn’t respond, Damien turned his head toward her. “Are you hurt?” he demanded. “Damien,” she whispered. Her voice was full of fear. Her hand squeezed around his arm. Suddenly, the forest shifted. Damien’s head spun and his footing wavered. Damn, he thought frantically. Damn! The poison. Not now. He couldn’t let it cloud his mind. Not with another assassin waiting for Aurora. Damien turned to Aurora. He had to get her out of there. He looked around, but he could barely focus. His vision wavered, focusing and then blurring, clear then hazy. No, he thought. Not now. He glanced down at Aurora. Her large eyes looked to him for protection. He cursed. “Run,” he told her. He saw her eyes widen and his heart ached. Anxiety knotted tight in his stomach. She was so beautiful. So innocent. So frightened. Damien could not let anyone hurt her. But right now, he couldn’t prevent it. His eyes rolled and he toppled forward to the ground. This was an amazing book. It is so hard to find books (especially good reads) set in this era. I love reading authors ideas about everything set in the medieval era. O’Donnell did not only up to my expectations, she surpassed them. I only found one thing wrong with the book. It ended! Yes, I did not want the book to end. I wanted to keep reading. What did I like about the book? Well, let’s see, Hmmm, Oh yeah I remember. Everything. I loved everything about this book. Thanks for a read that I will always remember. Looking forward to reading more by O’Donnell in the future. 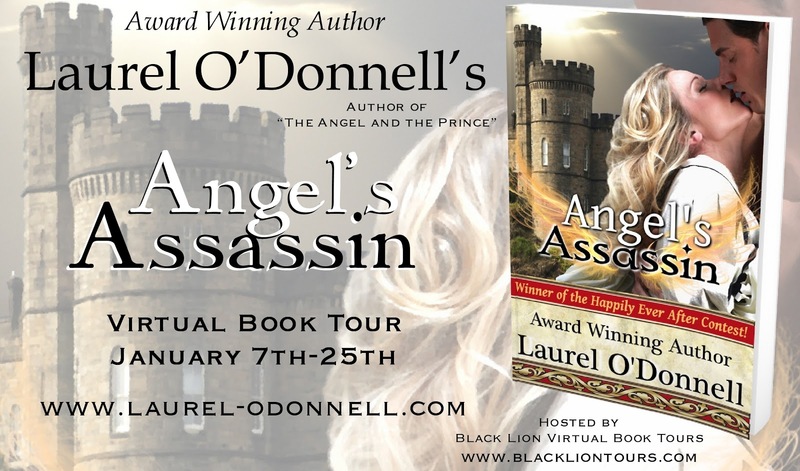 The author is giving away one copy of “Angel’s Assassin” and one copy of her medieval romance, “The Angel and The Prince”. Congrats on the new release. Angel's Assassin sounds fantastic. I can't wait to read it to see what happens next. Do Damien and Aurora get out of their predicament? Love your ten things list. Thank you for hosting Laurel today! Now, I couldn't tell–did you like the book? 🙂 Great review! Thanks so much for hosting me! 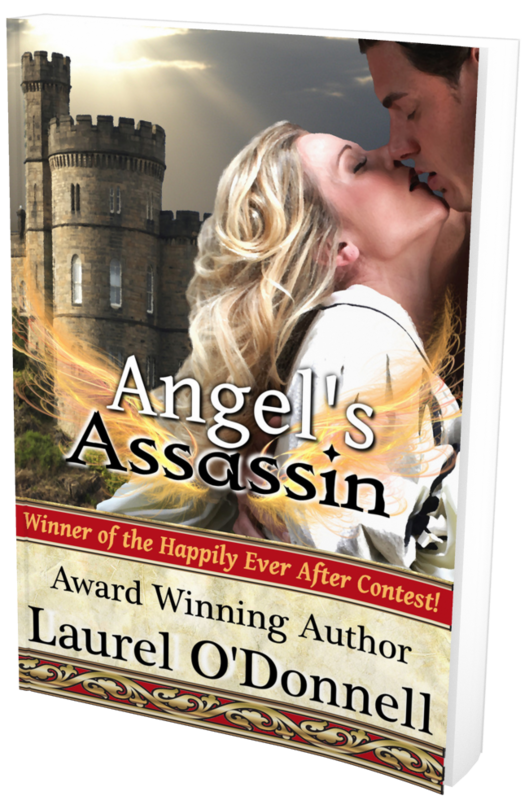 Hope your readers enjoy Angel's Assassin!